Chinese Tea Shop - Where's the Authentic Source? 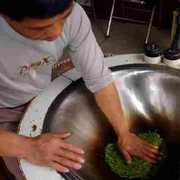 This Chinese tea shop gets its tea leaves directly from the authentic Source - but where is this Source? To many Westerners, the idea of authenticity is a foreign one. Quality is quality. Should we care about the Authentic Source of a particular type of tea? Because the Source has the lineage. At the Source, there are people who understand the art of cultivating and making tea. Traditions are passed down from generation to generation. Hundreds of years ago, their forefathers produce the highest quality tea for the emperors and his imperial court. Today, they produce teas for industry insiders, privileged politicians, people who can afford to pay but do not quite understand why these teas look, taste and feel so good. With lineage, people learn how to nourish, preserve and sustain the pristine growing conditions. It is the lineage that keeps the tradition alive. But the lineage only begins because the people happened to live in a very special place - a famous tea village. When you found yourself hearing about how wonderful a tea can be - think again. A name is just a name. The same tea can be produced in so many places with varying degree of quality. It is the famous tea village that makes a tea famous, not the other way around. Famous Teas became famous because they were crafted from rarely available plant materials. The irony is that once a tea becomes famous, there is insufficient supply to meet the explosive demands. Production expands to second and third rate regions surrounding the Authentic Source. Unless your tea shop does his homework, he has no way of telling if a tea is the real thing. In this Chinese Tea Shop, we care passionately about the Authentic Source. We look and look and look until we find something of high quality AND value for money. If the Authentic Source is not offering value, we go for "Near the Source". Whichever route we decide to take, the tea has to offer quality, value and consistency. It has to look good, taste good and feel good. What is so special these famous tea villages? Surprise, surprise, surprise. 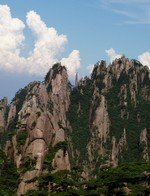 Authentic Sources are usually located at high mountains, in areas of exceptional beauty. Short daylight, moderate climate, moist conditions and fertile soil combine to grow tea that is rich in catechins (antioxidant) and theanine contents. Tea industry is so successful here that it dominates the entire region. There is no man-made pollution coming from factories. Tea gardens are found in secluded locations, inaccessible with little road traffic. Over centuries, tea plants, pests and anti-pests have learnt to co-exist in equilibrium. Farmers continue to use pre-industrial farming techniques. There is little or no need to spray pesticides. Authentic Chinese gourmet teas are handpicked and handroasted the traditional way. Most tea gardens are small, family run businesses. They command pricing power. They are not poor peasants, but moderately wealthy growers. They understand drinkers pay a premium for quality. They are careful not to kill the goose that lays the golden eggs. The highest grade green tea gardens harvest their crops once a year for 4 to 6 weeks in spring. In contrast, it is common practice for other tea gardens (both Chinese and overseas) to harvest 4 times yearly over many weeks. More is not better. Authentic tea growers never confuse quality and quantity.